The Harshad Chopda and Jennifer Winget starrer romantic thriller, Bepannaah entered the top-5 for this week. Undoubtedly, this is a dream start for the show as it grabbed 2.6 rating points this week. Started in late 2013, the romantic drama, Yeh Hai Mohabbatein managed to please the viewers with the amazing chemistry between Karan Patel and Divyanka Tripathi. The show is still among the most popular Indian soap operas. To conclude, it captured the fourth spot with 2.8 points this week. Taarak Mehta Ka Ooltah Chashmah is on the favorite list of millions of people. To conclude, the show held its third spot with the TRP of 2.8. Zee TV’s Kumkum Bhagya kept the viewer’s attention trapped with its content. 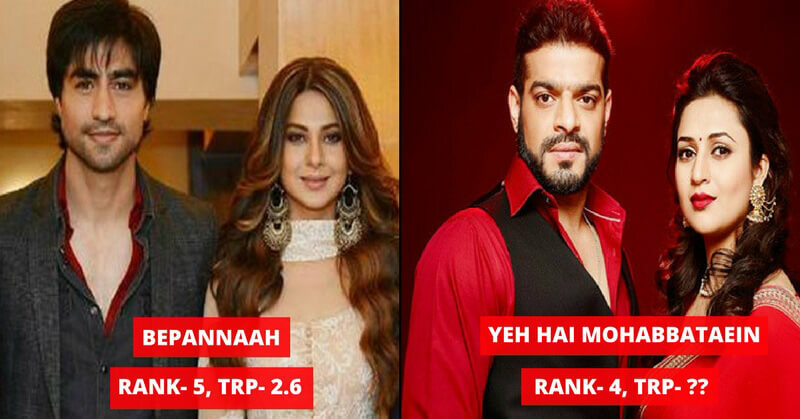 The show remained on its second spot, however; there is a slight improvement in the TRP. The show secured 3.2 points. Zee TV’s romantic drama serial, Kundali Bhagya held onto its top spot. The show got 3.5 Television Rating Points. It seems like the reign of the show is far away to be over. Do you think Bepannah will climb on the list next week? Share your thoughts in the comments. Also, check these TV actors fell for their co-stars.